← Make Your Veggies Famous With Real Time Farms! Earlier this week Cara and Karl hosted a pickling party, and each of the three couples in attendance brought supplies and ingredients to pickle a different vegetable. I have been missing Japanese tsukemono (pickles), so my initial idea was to recreate those. However, since most of those pickles really only require a pickle press, salt, and time, I decided that they weren’t party worthy, and searched for a different method of pickling my eggplant (purchased from the Ann Arbor Farmers Market). almost instant eggplant pickles, based on this recipe. 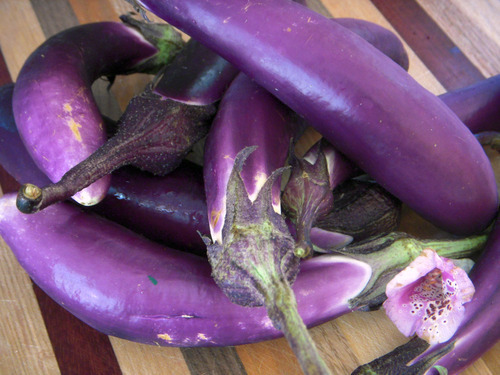 The recipe was easy, and although it isn’t suitable for canning, the eggplant is so tasty I doubt it will last very long in your fridge anyway. 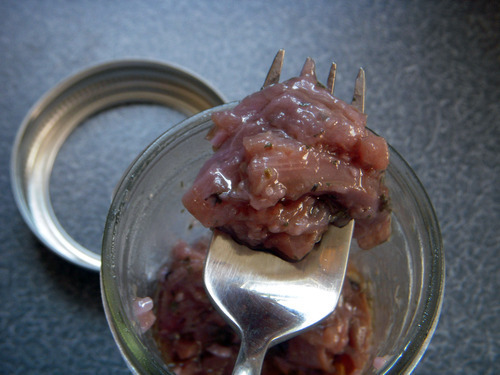 I think it would be delicious on crusty bread, but so far, I’m just enjoying it straight out of the jar on a fork! 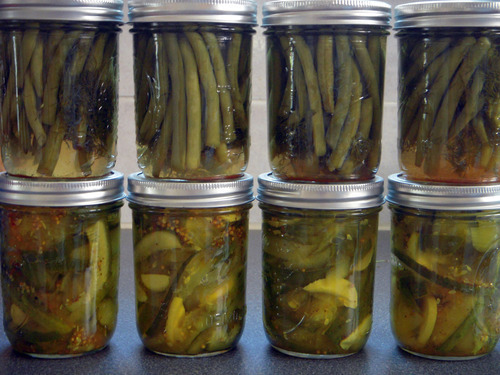 The other selected pickles were dilly beans and bread and butter pickles, both recipes from Ball, and they can be found by clicking the links. Both of these took longer than mine did, but that is because we properly (and successfully!) canned them, so we’re all going to try our best to wait the suggested 4-6 weeks before opening them up and testing just how well we did with our first attempts at pickling! This entry was posted in In the Kitchen (recipes & more) and tagged canning, eggplant, green beans, lindsay jean hard, pickles, Real Time Farms. Bookmark the permalink.